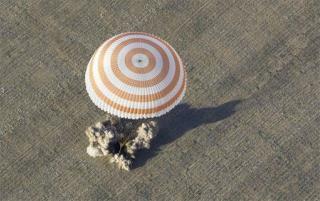 (Newser) – One American and two Russian astronauts landed safely back on terra firma early today when their Soyuz capsule hit the ground in Kazakhstan. The three, who spent 123 days at the International Space Station, "are safe and adjusting to gravity," tweeted NASA. "I feel great," said cosmonaut Gennady Padalka, who has spent a total of 711 days in space over four missions. "It's good to be home," said American Joe Acaba as he gave a thumbs-up. Damn shame we don't spend all that money on American soil. Hey, it is Paul Simon circa 1972! !